I just realized I never shared the evergreen jacket I made for my September contributor post over at Imagine Gnats. 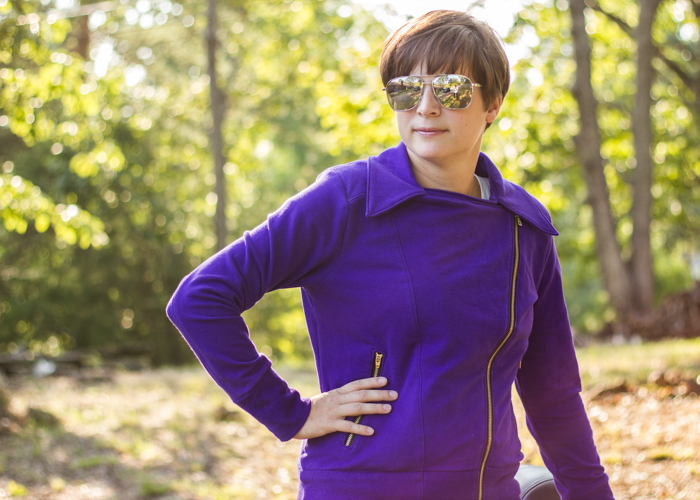 This purple french terry from Rachael is so amazingly awesome and my husband got some pretty great pictures of me on his bike so make sure to go check it out if you haven’t yet! I won’t typically wear it zipped up like this, but I kinda love this picture so I had to share it with you. 🙂 Purple lovers unite! This entry was posted in Selfish Sewing and tagged womens motorcycle jacket by oliver's fancy. Bookmark the permalink.